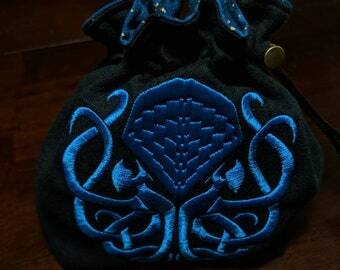 Exclusive Needle & Threadly Cthulhu design inspired by Isabel Collier's knotwork Cthulhu graces the front of this large, fully lined tile/dice bag. 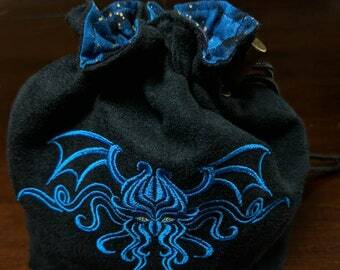 Look inside and you'll see that the lining fabric continues the Lovecraft theme with a fantastic Cthulhu motif. 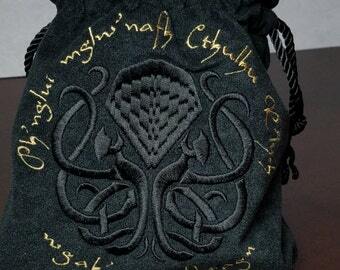 Slightly modified from the Knotwork Cthulhu embroidery design used on the XL bag, it's still all the Cthulhu you hoped for and more. Perfect for holding tiles for Arkham Horror, Eldritch Horror, Arkham Horror The Card Game, etc. 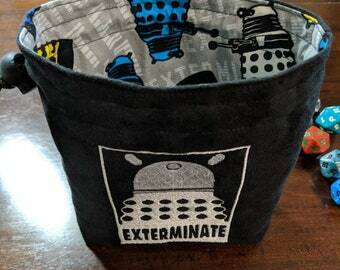 The bag is ~5"w x 6"h and is gusseted at the bottom so that it will stand on its own open or closed. 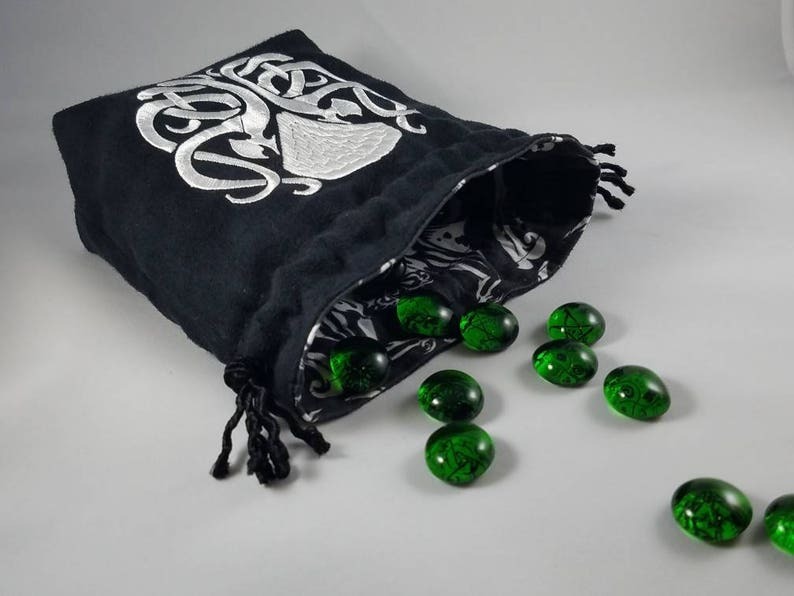 This large size is great for when you have to stick your hand in and fish around for tiles or if you need a bag to hold loads of dice. 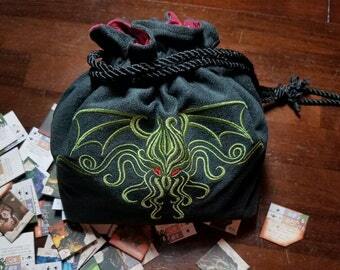 An excellent addition to any Lovecraft fan's gaming swag. This is a smaller version of my popular XL bag featured on Arkham Horror YouTube channel. This listing is made to order, please expect 7-10 working days before it ships out. Made of poly blend microsuede exterior, and a truly standout Cthulhu horror lining fabric. Your choice of Kona cotton or polyester satin. 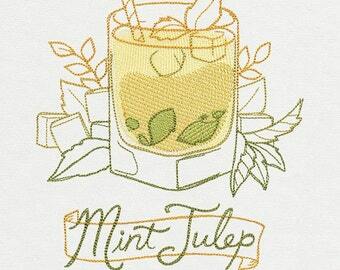 Embroidery done with rayon embroidery thread. 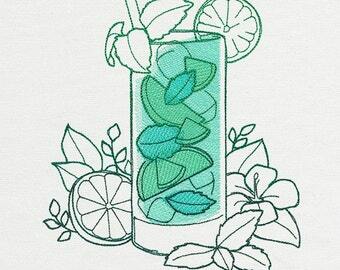 Love this design, but want it in a different color, different size, cover only, etc? I relish custom orders! Request a custom order from the link at the top of the listing, and we'll talk about what you're after. Want to order more than one item? Awesome! Etsy should automatically calculate the shipping, and I always refund overages. 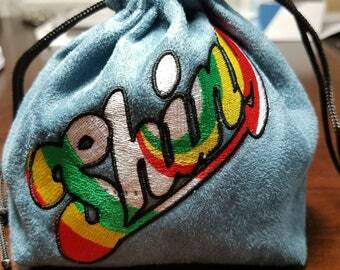 Dice bag is made from gorgeous materials, and it is so functional. I love that is sits up by itself. And the quality of construction tells me it's going to last me through many, many games. 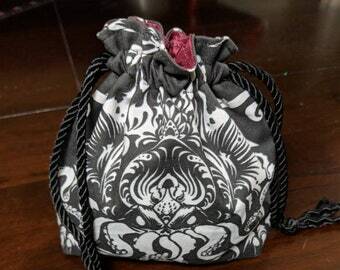 A great bag for the tokens in Cthulhu Wars, just the right size. Great build quality and customer service. What can I say? It's exactly what I wanted, great quality, got to me in a timely manner even though they are made to order. I'll be recommending this bag to others.